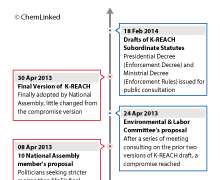 Act on Registration and Evaluation of Chemical Substances—"K-REACH"
The Act on Registration and Evaluation of Chemicals of Korea (a.k.a “K-REACH”) was passed on Apr 30, 2013 and revised several times. It is regarded as the first REACH-style chemical regulation adopted in an Asian country. K-REACH manages new chemical substances, existing chemical substances and downstream products by prescribing the requirements for registration, hazard evaluation and risk assessment. This webpage is designed to assist non-Korean companies, particularly SMEs, in identifying their obligations under K-REACH so they can take the necessary steps to ensure compliance with this regulation. Note: On 9 Jan 2017, South Korea’s Ministry of Environment notified the Committee on Technical Barriers to Trade under World Trade Organization (WTO) of a proposed revision to the Act on Registration and Evaluation of Chemical Substances (K-REACH). The amendments to K-REACH were passed by South Korea's Cabinet on 8 Aug 2017. On 28 Feb 2018, the amendments were passed by the plenary session of the National Assembly. The proposal (click here to see major amendments) was promulgated by the president on 20 Mar as Law No. 15512 and will take into force on 1 Jan 2019. Amendments regarding reduction of vertebrate animal testing during generation of registration data have been passed and incorporated into the revised version of K-REACH as Law No. 15584 on 17 Apr 2018. The new requirements will come into force on 1 Jan 2019 as well as the other amendments. The chart below is a conceptual representation of the K-REACH framework. Chemicals and products (mixtures and articles) are regulated differently as illustrated. K-REACH equires the mandatory reporting, registration and notification of manufactured and imported new chemical substances, existing chemical substances, and products containing hazardous substances. 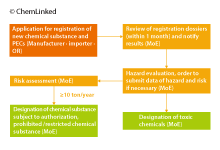 The information concerning the volume and uses of the existing chemical substances (≥1 ton/y) and all new chemical substances should be reported annually. 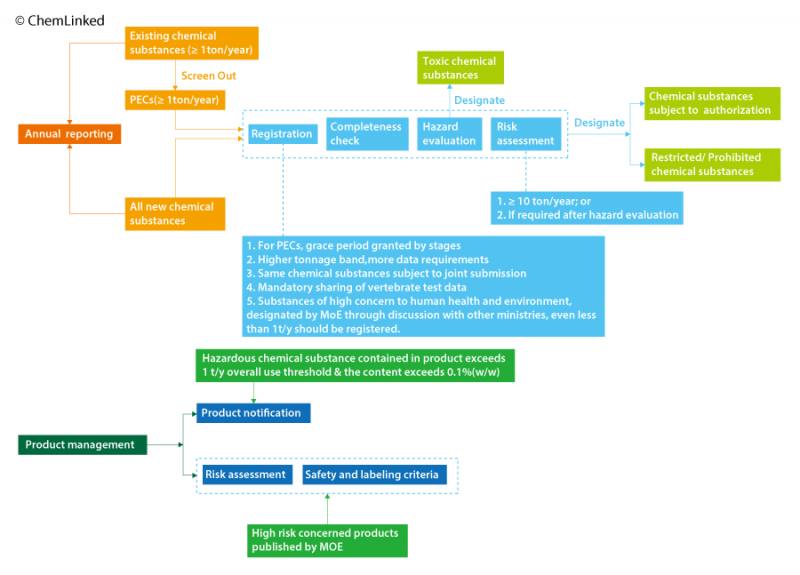 The priority evaluation chemicals (PECs) selected from the Korean Existing Chemicals Inventory (KECI) which are, manufactured or imported at or over 1 ton per year, are required for registration (including certain chemicals likely to cause significant damage to human health and environment even < 1 t/y) , so do all new chemical substances regardless of tonnage. K-REACH will allow the Ministry of the Environment (MoE) to perform hazard evaluation and risk assessment. According to the results of hazard evaluation, MoE will designate toxic chemical substances. Based on the hazard evaluation and risk assessment, MoE will impose production and importing requirements necessitating substances undergo authorization, restriction or prohibition. Appropriate safety and labeling criteria will be issued by the MoE for the high risk concerned products based on the results of risk assessment. Korean manufacturers or importers of new chemicals and priority evaluation chemicals (PECs) shall submit registration to the Ministry of Environmental (MOE) prior to manufacture and import. Foreign manufacturers may appoint an Only Representative (OR) to fulfill relevant obligations under K-REACH. Importers in South Korea may turn to their non-Korean suppliers and request information that they may need to fulfill their regulatory obligations. Downstream users and sellers are also required to comply with certain aspects of K-REACH. Sellers in South Korea should fulfill the annual reporting obligation under K-REACH, the same as manufacturers, importers and ORs. The sellers mentioned above are those selling chemicals to be used as raw materials in workplace. However, the downstream users are exempted from reporting obligations. As for information exchange, a two-way communication mechanism is adopted to involve manufacturers, importers and their downstream users and sellers in the same supply chain. 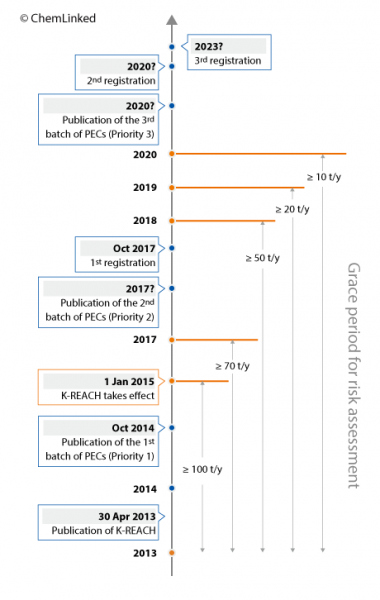 South Korea has been working on its own “REACH-style” regulation for the registration and evaluation of chemicals since 2011. 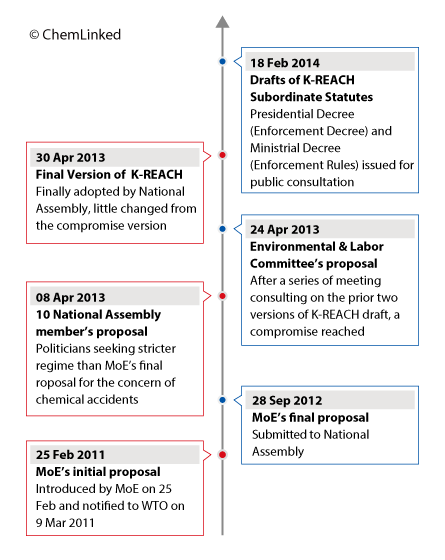 The final version of K-REACH was passed by the National Assembly on 30 April 2013, and came into force on 1 Jan 2015. Since its notification to the WTO on 9 March 2011 (G/TBT/N/KOR/305), the draft proposal has been revised several times focusing on the registration, evaluation, authorization and restriction of new chemicals and existing chemicals that are manufactured in or imported to South Korea. The Act was slightly revised on 27 Jan 2016 (no major impacts on the compliance work) and the amendments came into force on 28 Jan 2017 as Law No.13891. The latest amendments to K-REACH were promulgated by the president on 20 Mar 2018 as Law No. 15512, which is a significant deviation from the regulatory mechanisms outlined in the previous version. The revised K-REACH is almost identical to EU REACH and will take into force on 1 Jan 2019. Amendments regarding reduction of vertebrate animal testing during generation of registration data were incorporated into the revised version of K-REACH as Law No. 15584 on 17 Apr 2018. The new requirements will come into force on 1 Jan 2019 as well as the other amendments. Since the issuance of the first MoE K-REACH draft there has been a debate on reporting frequency requirements, vacillating between compulsory annual reporting or biennial reporting. The official K-REACH stipulates that the manufacturers, importers or sellers should report annually to MoE the volume and uses etc. of all new chemical substances and existing chemical substances at or above 1 ton/year in the previous year. It should be noted that downstream users are exempted from the annual reporting requirement. The substances tonnage and usage information of the previous year (1 Jan-31 Dec) is required to be submitted by 30 Jun. Latest update: According to the revised K-REACH (to be effective on 1 Jan 2019), the current annual reporting system will be abolished. Instead, a pre-registration system will be adopted. 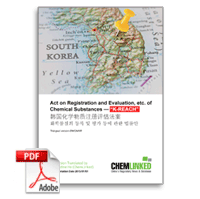 According to the authority, there is no need for duplicate reporting as South Korea’s Chemicals Control Act (CCA) already requires statistical survey on chemical substances. The establishment of a pre-registration system is for companies planning to register phase-in (existing) substances and will streamline mandatory joint registration of identical substances. As stipulated in K-REACH, the manufacturers or importers of new chemicals and priority evaluation chemicals (PECs) shall submit registration to the Ministry of Environmental (MoE) prior to manufacture and import. The tonnage threshold for existing chemical registration is set as 1 ton per year. Latest update: According to the revised K-REACH (to be effective on 1 Jan 2019), as long as a chemical substance is manufactured or imported for the purpose of export only, regardless of volume (currently limit is set as less than 10 ton per year), it can be exempt from registration. K-REACH only requires the PECs designated by the MoE to be registered. This regime is unlike the EU REACH which covers all existing chemicals indiscriminately. The PECs over 1 tonne per year should be registered. However, due to concerns for human health and the environment, some chemicals even less than 1 ton per year will still be subject to registration, which will be designated by the MoE through discussion with relevant ministries. According to MoE’s public hearing on 27 June 2011, the prority list of 2,086 substances has been drafted. The criteria for designation of PECs are specified in the table as above. The PECs are screened from existing chemicals based on the exposure, hazard information and trading volume, etc. The final PECs list will contain around 2,000 to 2,500 chemicals and will be categorized as priority 1, 2 and 3 chemical substances. The lists will be issued every three years and registration obligations for each list will be postponed for a three-year grace period from the publication date of the priority list. The list of priority 1 substances containing 510 substances has been published on 1 Jul 2015. The second batch will be announced in 2018 and the third batch is expected to be announced in 2021. Latest update: According to the revised K-REACH (to be effective on 1 Jan 2019), the system for designation of priority existing chemicals (PECs) in three batches for joint registration will be deleted. Instead, a phase-in registration mechanism for around 7,000 existing chemical substances (≥1t/y) will be applied. MoE is currently preparing the whole list. In addition, phase-in deadlines will be set based on tonnage band (1-10 t/y, 10-100 t/y, 100-1000 t/y, >1000 t/y), which is similar to EU REACH. It should be noted that the deadline of 30 Jun 2018 for registration of the 510 PECs under current K-REACH regulation will still apply. The Notification System of New Chemicals in South Korea before 2015 was governed by Toxic Chemical Control Act (TCCA) of the MoE and Occupational Safety and Health Act (OSHA) of the Ministry of Employment and Labor (MoEL). The Korea Existing Chemicals Inventory (KECI) contains around 36,000 chemicals that were domestically circulated in South Korea prior to Feb 2, 1991 or those published by MoE after hazard evaluation under TCCA after Feb 2, 1991. Those not listed in the KECI are regarded as new chemical substances subject to new chemical registration. The manufacturers and importers of new chemical substances exceeding 0.1 tonne per year are required to apply to MoEL and MoE for the notification or apply to Korea Chemicals Management Association (KCMA) for the confirmation of exemption prior to market entry. Registration of new chemical substances was transferred from TCCA to K-REACH from 1 Jan 2015. All new chemical substances regardless of tonnge are required to be registered. However, a simplified registration with less data requirements is applicable for new chemical substances in low volume below 1 t/y (threshold will be reduced to 0.1 t/y after 2020). In addition, OSHA shoulod also be complied with as before, whcih means under OSHA new substances<0.1t/y are exempt from registration. Latest update: According to the revised K-REACH (to be effective on 1 Jan 2019), For new chemical substances<100kg/y, they only require notification rather than registration. In cases of modification of volume (manufacture or import), usage or hazardous properties, re-registration reflecting all updates and amendments should be submitted. For example, if the manufacture or import tonnage of the registered substance exceeds the tonnage quantity within the registered tonnage band, the registrant must re-register to increase the tonnage band, which also applies to change of uses, hazard and risk information, etc. As for the change of applicant information, the registrant should notify changes to MoE. The corresponding supplementary materials required for re-registration of changes and notification of changes will be specified in subordinate statutes. Changes in Re-registration: change of tonnage band, change of uses, hazard and risk information, etc. Changes in Notification: change of applicant information, e.g. name of registrant, address, representative. K-REACH prohibits repetitive generation of vertebrate animal test data. If vertebrate test data is already available, the potential registrant should petition the owner of this data to prevent duplication of experimental data thereby minimizing animal testing. If refusal of data sharing is justified arising from confidentiality issues, submission without vertebrate test data may be accepted if prior consent is given by the MoE. In cases of refusal to share vertebrate test data (without justification) the data owners can be punished by having their own test data deemed inadmissible. The period for data protection under K-REACH is 15 years, after which, the data can be freely used regardless of any objections from the data owner. Latest update: Amendments regarding reduction of vertebrate animal testing during generation of registration data have been passed and incorporated into the revised version of K-REACH as Law No. 15584 on 17 Apr 2018. The new requirements will come into force on 1 Jan 2019. The authority will develop and adopt alternative tests to minimize the use of vertebrate animals (newly added Article 4 Paragraph 5 of K-REACH). In addition, industry also needs to prioritize alternative animal testing during data generation (newly added Article 5 Paragraph 5). The vertebrate animal testing minimizing principle is adopted as a new Article 16-2 during chemical registration, hazard evaluation and risk assessment. As stipulated in Revised Article 17, any person who intends to apply for registration shall confirm in advance if there is existing vertebrate animal test data. For more deatils, please see ChemLinked news. The MoE will conduct hazard evaluation on the registered substances. MoE may require additional data from the registrant if deemed necessary for hazard evaluation. The toxic chemical substances will be designated based on the hazard evaluation outcome, which is consistent with the criteria under the previous TCCA. The information, such as the chemical name, hazard properties will be disclosed to the public for reference after hazard evaluation. Generic names can be used for publication if data protection applies. However, once it is designated as toxic chemical, the generic name cannot be adopted. Risk assessment is required for substances manufactured or imported for 10 tons or more per year, or when the result of hazard evaluation implies the necessity of further risk assessment. Based on the hazard evaluation and risk assessment, MoE will designate the substances subject to authorization, restriction or prohibition. Generally, the SVHC such as CMRs and PBTs will be designated for authorization with specific sunset date. Only those authorized before the deadline can continue to be circulated on the market after the sunset date. However, the status of chemicals for authorization is subject to change due to the possible development of new technology or substituted chemicals, etc. Joint submission of registration dossiers on the same chemicals is an obligation under K-REACH with the goal of reducing the burden on the industry and avoiding duplicate generation of test data. The individual submission could be applicable in special cases if approved by MoE in advance. A pre-set institution like the Substance Information Exchange Forum (SIEF) is established for chemical information exchange. The SIEF is a borrowed concept from EU REACH, like EU REACH the co-registrants will be required to purchase distinct endpoint data from the lead registrant (LR) and use them in their own separate dossiers. K-REACH adopts a two-way communication mechanism under which the suppliers should provide chemical information to recipients, and vice versa. The manufacturer and importer of registered substances or mixtures containing registered substances should provide registration No., chemical name, hazard & risk information, safe use information to the downstream user and seller. Downstream users and sellers should also provide its manufacturer or importer the use, exposure, volume of use or sale, safe use information etc. upon request. If any changes occur, the updates should be informed to upperstream and downstream parties within one month. Under K-REACH, the definition of a "product" covers both mixtures and articles for consumer use. Product notification is required for manufacturers or importers if the hazardous chemical substance content contained in the product exceeds 1 ton per year and the content exceeds 0.1% weight ratio threshold. Although finished articles which do not release chemicals are exempted, the requirements on product notification will affect nearly all types of consumer products. The hazardous chemical substances include toxic chemical substances, substances subject to authorization, restriction and prohibition. The name of hazardous substance, content, hazard information, use of the hazardous chemical substance in the product should be notified to MoE. However, if the hazardous substance has already been registered under K-REACH, the product can be manufactured or imported without production notification if the "Exemption Confirmation of Notification" from MoE is obtained in advance. The list of risk concerned products was published by MoE considering their potential risks posed to human health and environment, including detergent products, coating/adhesive products, air freshener products, dye products, biocidal products, etc. Manufacture or importation of risk concerned products requires product testing in some specialized institutes every three years to verify compliance with the safety standards and keep testing reports for inspections. 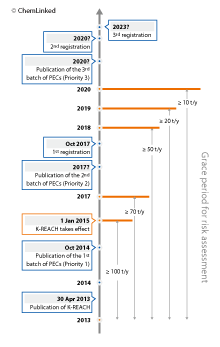 Latest update: The risk concerned products currently managed under K-REACH will be managed by a new Act, namely the "Act on Safety Management of Consumer Chemical Products and Biocides”(K-BPR). The name of “risk concerned product” will be changed to “household chemical product subject to suitability confirmation”. It is expected to cover more household products under K-BPR. K-BPR was promulgated by the president on 20 March 2018 as Law No. 15511. The new law will enter into force on 1 Jan 2019 (See ChemLinked news). The manufacturers, importers and foreign companies exporting to South Korea should keep track of new chemical substances, PECs and hazardous chemicals contained in their products. Foreign companies not based in South Korea shall accomplish registration and the follow-up obligations by designating an OR. Here is a brief summary of obligations under Korea REACH. Registration Joint submission is of obligation, with individual submission applicable in special cases; or apply for exemption; higher tonnage band, more data requirements. Information communication Registration No., chemical name, hazard & risk information, safe use information need to be passed to downstream users and sellers; if changes occur, the updates should be informed to any upper and down-stream parties no later than 1 month. High risk concerned product Follow the restriction or prohibition on the use of some hazardous substances in high risk concerned products and pay attention to the threshold for substance content, migration or evaporation. Nadine He, 9 Jan 2018, "K-REACH Enforcement Decree Amendments"
Nadine He, 1 Dec 2015, " K-REACH Notification of Products Containing Hazardous Chemical Substance"
Nadine He, 20 Mar 2015, "Registration Exemption under K-REACH"
William Chou, 30 Dec 2014, "How K-REACH Will Affect the Flavors and Fragrances Industry"
^ "South Korea's National Assembly Aadopts K-REACH". LawBC. 17 May 2013. 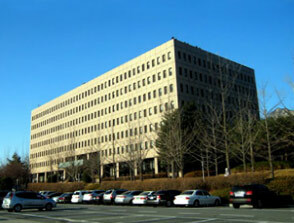 ^ "Korean Legislature Adopts K-REACH". 3E Company. 6 June 2013.